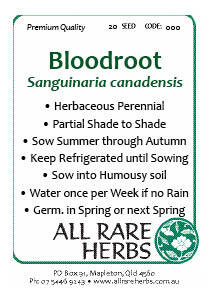 Bloodroot, Sanguinaria canadensis, is also known as Red Puccoon, Indian Paint and Tetterwort. A low-dose botanical, native to the moist woodlands of Canada and eastern USA. Plant sap contains important alkaloids. Herbaceous perennial. Sow immediately upon receipt into a shade garden or forest bed. Emergence may take 1-2 vernal cycles. Be the first to review “Bloodroot, seed” Click here to cancel reply.